Jefferson Parish harvests a hefty crop of fun things to do this fall. Take a look at all there is to do this October and November! Lafreniere Live! Fall Concert Series — This park is one of our favorites in the area, and on Thursday, Oct. 13 from 6:30 until 8:30 p.m., it’s also your spot for live music. Check out The Strays at this free concert taking place at Al Copeland Meadow Concert Stage inside the park. Vendors are on site for food and drinks! Oktoberfest — Three straight weekends of German food, music, and beer with contests every single day (including Dachshund races!). It’s a whole lot of fun in Kenner’s charming Rivertown. Head there from 4 p.m. until 11 p.m. on Fridays and from 1 p.m. until 11 p.m. on Saturdays throughout October. Admission is $8, but kids ages 12 and under are free. Junie B. Jones: The Musical — Rivertown Theaters for the Performing Arts takes on the beloved children’s book character Junie B. in this family-friendly play running Oct. 7-16. Tickets are $15. Park-A-Boo — Lafreniere Park is at it again with fun programming Oct. 21-23 with their Park-A-Boo event. Costumes are encouraged at this safe Halloween event featuring trick or treating, activities, a boo house, and more for families with kids ages 13 and younger. Food booths will serve up kid-friendly favorites like pizza, hot dogs, and soft drinks. Admission is $8 for adults, $6 for kids, and free for children under 2. Bucktown Seafood Festival — Head to 1600 Lake Avenue for music and food all weekend during the 19th annual Bucktown Seafood Festival. Deanie’s seafood provides the grub, and you’ll hear music from bands like Contraflow and Category 6. There will also be rides and games for all ages plus a crafts fair, raffle prizes, and more. Hocus Pocus at Muss Bertolino Park — The City of Kenner screens the Disney favorite on Oct. 29 at 7:30 p.m. Admission is free, and costumes are encouraged! There are also games and photo opportunities starting at 5:30 p.m. prior to the screening. Funny Girl — Jefferson Performing Arts Society in Metairie presents this classic musical theater performance Fridays and Saturdays at 7:30 p.m. and Sundays at 2 p.m. from Nov. 4-13. Tickets are available from $30. 1776 The Musical — Harness your patriotism just in time for elections at this Rivertown Theaters event running Nov. 4-20. Tickets from $36. Oyster Festival — On Nov. 11-13, check out Oyster Fest at 3978 West Esplanade Ave. in Metairie. This local community fair features live music, crafts, games, kids’ activities, and a whole lot of oysters! Admission is free. Pecan Festival — With Thanksgiving in mind, the Pecan Festival is overflowing with pecan dishes (including pie!). Admission is free and includes live music, games, and plenty of family fun. Kenner Christmas Village — Ring in the holidays at this annual event lighting up Main Street USA in the Rivertown historic district starting on Nov. 27. Admission is free to this festive holiday village, studded in Christmas lights and animated scenery from 5:30 until 8:30 p.m. throughout the holiday season. Fall fashion is always a favorite – this is the time of year when we can pull out our sweaters and boots (or perhaps buy some new ones!). But what about your apartment? Keeping a tight budget in mind – so you can splurge on that new sweater – we’ve collected a few great fall decorating tips from our 1st Lake Properties designer for fall decorating. Follow along to learn how to spruce up your place for the season. The results are easy on the wallet full and of aesthetic impact! This fall vignette from Craftberry Bush features a variety of textures that bring the outdoors in. One of the easiest ways to update your apartment for fall is to keep an autumn color palette in mind. Our designer suggests incorporating yellows, golds, browns, grays, and oranges as accent colors using items like vases, dishtowels, tablecloths, and plates. Thrifty options to find seasonal accent pieces include stores like TJ Maxx and Amazon. Or, you can literally thrift! Goodwill is great for bargain hunting: try this Goodwill locator to find a thrift store nearest your apartment. Bring in the same colors mentioned above, or create a more earthy and textured look by using clips and a painters cloth. You can purchase painters cloths at a store like Lowe’s for less than $15 a piece. Use curtain clips (order them on Amazon!) to hang them. As the temperature cools down, you can add warmth through color palette and texture. Items like pillows and blankets are a great way to create varied textures and add a cozy feel to your space. Pumpkins and gourds are another great way to add texture and create a natural, autumnal affect. Our designer suggests throwing some white pumpkins into the mix to create a cohesive look. Who doesn’t love a good pumpkin farm? Here’s a link with pumpkin farms around the area. Candle warmers can be found for $15 or less at Target or Bed Bath and Beyond (Goodwill, too!). Purchase a scent like pumpkin spice, cinnamon, or maple so your apartment smells just as cozy as it feels. Floral arrangements always look beautiful inside apartments, but you can up the ante during the fall by incorporating rich colors and other types of vegetation: sunflowers, gourds, and grains of wheat (fake or real!) create an autumn harvest aesthetic. We’ve already mentioned some of our favorite affordable stores like Goodwill, Target, and Bed Bath and Beyond. Michael’s and Hobby Lobby are two other bargain-friendly stores located close to many of our apartments. Plus, you can use Hobby Lobby’s weekly 40% discount coupon. Happy fall! Hosting a dinner party is a great way to enjoy an intimate evening with friends and family. But it can feel like the pressure is on: the menu, the music, and the atmosphere all come into play. We’ve collected a few top tips to hosting a successful dinner party. Get cooking! Plan ahead. You’ll want to give your guests plenty of notice about when you’re hosting your party, and you’ll also want to ask about any food allergies in advance. Remember to choose friends who get along together (or whom you think will get along), and aim to keep the group at about six people. Set the table the night before. Trust us: even with the most careful planning in place, chances are you’ll have your hands full the night of the dinner party. Do what you can in advance, including setting the table the night before. Make sure you have enough chairs plus proper utensils, extra napkins, and a bit of design elements — candles or flowers (or both!) are usually a nice touch. Buy ice. Whether your dinner party includes a signature drink or not, no beverage is quite as palatable when it’s warm. Even if you have an ice maker in your apartment, have at least one bag of ice on hand if the drinks really start to flow! Make a playlist. Or rely on someone else’s! Music is an integral part of a dinner party, and streaming services like Spotify and Pandora offer pre-made lists based on artists you enjoy or a particular mood you’re after. Lighting, lighting, lighting! Both you and your guests will likely appreciate soft lighting. Dim the lights a bit and use lamps where possible to strike a mood that feels fancy and fun, but not too formal. It’s easy to personalize nearly every room in the house while you’re a renter — just ask local interior designer Whitney Jones. But one room is a little more difficult to customize: the kitchen. 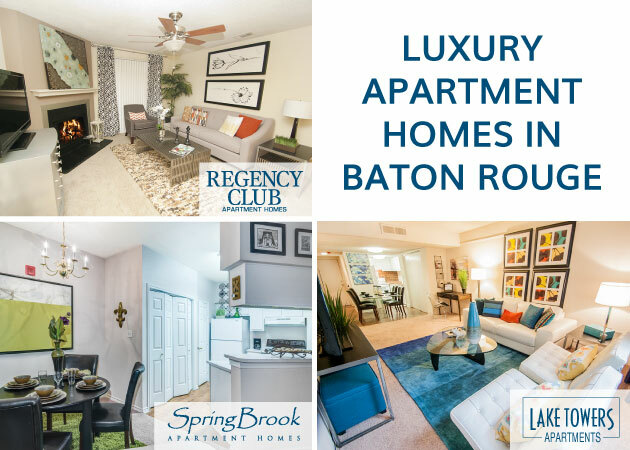 While we’re pleased to offer spacious, modern kitchens within our 1st Lake Properties, we know custom kitchen redos just aren’t in the cards for renters. However, with a little creativity, you can apply modern kitchen trends to your space. See a few of our favorite tips and tricks below. A soft palette ties together the kitchen in our Lakes of Chateau Estates North apartment community. Mid-Century Modern Accents — The mid-century modern resurgence has been a huge trend for the past few seasons, and by choosing pared-down shapes and palettes, you can ensure that these vintage-inspired pieces will continue to look fresh. We love the look Eames-style bar stools and a retro bar cart, which can serve as extra storage. Texture — Another trend in kitchen decor is texture: think textured tile, countertops, and patterns all together to create a layered look. Accents like woven placemats are a great and affordable way to incorporate texture. Soft Color Palettes — Both the mid-century and textural trends lean on soft color palettes as an underlying theme. By choosing light tones, you’ll create the look and feel of more space. Opt for light-colored accent pieces and appliances wherever you can for a fresh, on-trend look. Smart Storage — When incorporating decor, plan to add pieces with function. Wire baskets add a chic, industrial feel and are perfect for storing utensils, packaged food, linens, and more. You can also purchase a standalone island for added counter space and a pop of personal style. 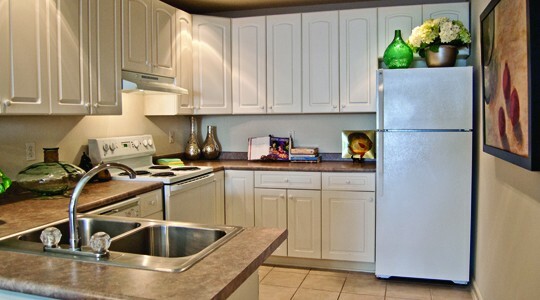 Open Kitchen/Living Spaces — Many of our properties feature joint kitchen and living spaces. 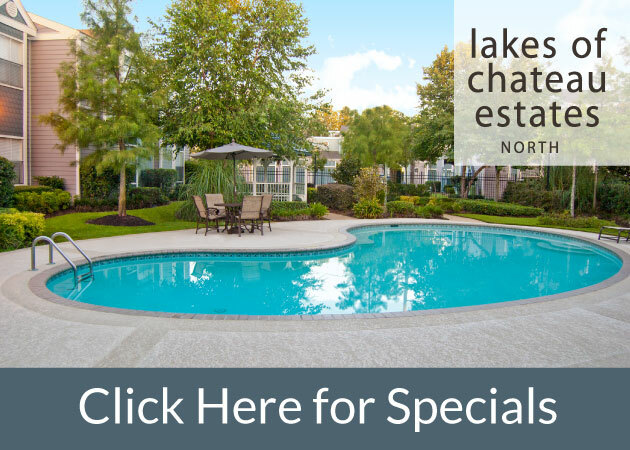 Remember, it’s easy to transfer between properties at 1st Lake if you’re interested in moving to one of our properties with state-of-the-art kitchens. 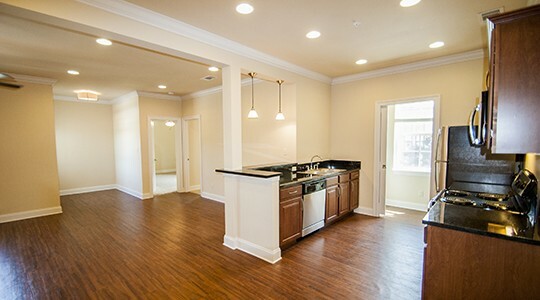 Our Surf Rider apartment community in Metairie offers spacious kitchens adjacent to the living space for an open feel. Utilize rugs — Rugs are a great way to add color and texture to the kitchen. Opt for a pattern, if possible, to mitigate any visible stains (hey, kitchen mishaps happen!). Add a mirror — Mirrors create the illusion of more space while also reflecting light. The kitchen probably isn’t the first place you’d think of to add a mirror, but you’ll be pleasantly surprised by the results! Incorporate a temporary backsplash — Peel-and-stick tiles or vinyl decals are an easy way to customize your rental kitchen. Take a look at Apartment Therapy for some ideas! Swap out hardware — Update pieces like drawer pulls, cabinet knobs, and even light switch plates. Just remember to make note of where all the original hardware was prior to removal, and keep it all in a safe spot! You’ll need to change everything back before you move. Bring the outdoors in — It’s amazing what a simple plant can do. Add easy-care indoor plants to your kitchen for increased oxygen and a splash of color. A heart-pumping workout is a great way to reduce stress — unless the gym creates a stressful environment in and of itself. While you can’t always control the actions of others, you can help create a focused workout zone by following basic gym etiquette. Take a look below, and follow these simple rules while you get your burn on at one of our many 1st Lake Fitness centers! The fitness center at Bella Ridge. Pack your gym bag like a pro. Stash your gym bag with essentials like a towel, wet wipes, and a water bottle. This means you won’t have to hog the water fountain, and if for some reason the gym is out of towels or wet wipes, you’ll be prepared. Wipe down equipment. Most gyms provide antibacterial wipes specifically for gym equipment. After your workout, wipe down any surfaces you’ve touched, whether a bench, weights, treadmill, bicycle, etc. Remember, even if you can’t see any evidence of sweat, germs are still present. Clean up after yourself to ensure the next person using the machine gets a truly fresh start. Follow time limits on machines. Gyms can be busy places, especially at peak hours like after work or early in the morning. Because of this, many fitness centers implement a time limit rule on machines like treadmills or ellipticals. Be courteous of others and only exercise for the allotted period of time. If you’re not quite finished working out, use the opportunity to try out a new machine instead. Stay home if you’re sick. While some doctors recommend a light workout to help your body recover more quickly from ailments like a cold or virus, plan to do an at-home workout video rather than put others at risk at the gym. If you do go, take extra care wiping down all the equipment, and wash your hands before and after you’re finished exercising. Mind headphones. You might be tempted to chat to your neighbor to help you get through a tough workout, but if they have headphones on, be respectful: they’re in the zone! Dress appropriately. Gyms are for focusing on your workout — not on someone else’s distracting clothing. If you’re worried about your outfit, test it out first at home to make sure everything stays put as you exercise. Put weights away. Dumbells can be hazardous when left on the mat for people to trip over. Always put free weights back after you use them. Please unload the weight bar as well to keep the weights area accessible for everyone and free of any obstacles. Watch your rest time between sets. If you’re resting for more than 10-20 seconds between sets, plan to excuse yourself from a machine to give someone else a chance to use it. However, keep in mind that ideally you’ll want to rest for no more than 10 seconds: studies show that short rest periods lead to increased caloric burn and a higher metabolic rate. Be courteous. Allow other gym-goers their space and respect during a workout session. If the gym is busy and you have the flexibility to come back later, consider adjusting your time.